Marsala is on full blast! This beautiful hues has been seen in many breathtaking spring weddings this year already. From enchanting earthy tones to vivid colors that compliment this year’s color, many are definitely embracing marsala for their special day. Incorporating this color has been such a success to transmit the idea from a romantic outdoor wedding to a simple intimate wedding. The ideas with the are endless. And now that many are planning their fall weddings, take a look at these amazing ideas for your special day. Include this luxurious color in your bouquet with delicate dahlias, peonies, ranunculus or even some purple pink succulents. Throw in some gold with your centerpieces and you will see the colors pop of radiance. Dress your wedding party with some marsala and they will love it. Those perfect brick color lips will be enchanting as the night falls. Writing your own wedding vows should come as a natural choice for a lot of you. After all, these are the main “laws” upon which you want to build your life together – so who else would be more appropriate to write them down and spell them out during the ceremony? First and foremost, you should know that there’s no rule when it comes to what you can say and what you cannot say. As long as what you say is sweet, romantic and shows how much you love and appreciate the person who is about to become your husband/wife, everything will be fine. At Irish weddings, it is traditional for certain members of the bridal party to make a speech at wedding reception venue. There are no set rules about who actually gets to speak or for how long, but at most weddings in Ireland, the father of the bride, the groom and the best man are most common.. 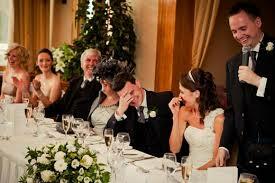 It is becoming increasingly popular to have the wedding speeches before the meal. This allows anybody about to give a speech less time to worry and enjoy the meal. How Long should the speeches be ?